The Ideal freeride machine! Extremely fast and light in the hand. 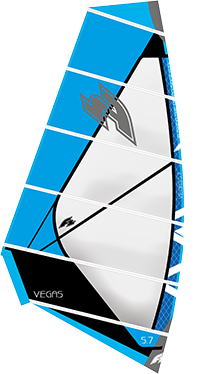 The cleverly reinforced sail frame makes the F2 VEGAS the object of desire. A successful mix of light but resistant materials makes the F2 VEGAS a long-lasting companion with which you can pass your buddies at any time. The striking design ensures that you are recognized from afar. The F2 VEGAS can be used with an RDM mast up to seven meters, which gives the sail a little more power. On a Freestyle Wave Board it is a sail that maximizes gliding and on any other Freeride or Freerace Board it is the best friend you can have.